During December 2010–March 2011 and August–December 2011, an excavation was conducted along the Upper Aqueduct to Jerusalem (Permit Nos. A-6059, A-6083; map ref. 22071–82/62795–820), prior to construction. 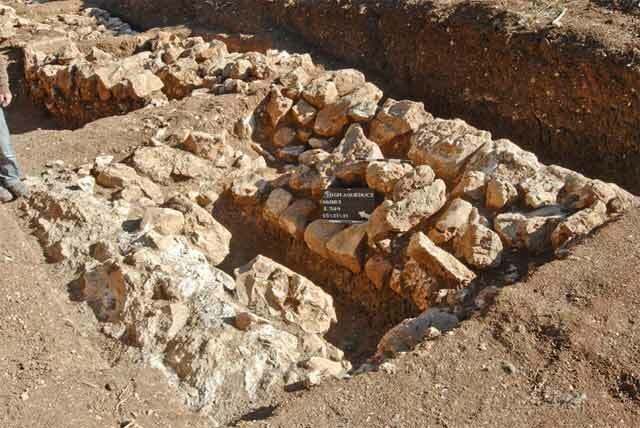 The excavation, undertaken on behalf of the Israel Antiquities Authority and underwritten by the Ministry of Construction and Housing, was directed by Y. Billig, with the assistance of B. Dolinka and S. Mizrahi (area supervision), N. Nehama and R. Abu-Halaf (administration), A. Hajian, M. Kunin and M. Kahan (surveying), B. Antin (drafting), A. Peretz and Y. Yolowitz (field photography), Skyview Company (aerial photography), B. Touri and S. el-‘Amlah (metal detection), A. Mashiah (conservation planning), I. Lidski-Resnikov (drawing of finds), L. Kupershmidt (metallurgical laboratory) and D.T. Ariel (numismatics). Two aqueducts that conveyed water from Solomon’s Pools to Jerusalem, the Low-Level and the High-Level Aqueducts, are known from the study of ancient aqueducts to Jerusalem. The Low-Level Aqueduct was built first, probably during the reign of the Hasmonean kings. It began at an elevation of c. 765 m above sea level and terminated at the Temple Mount, at an elevation of c. 738 m above sea level. The High-Level Aqueduct was installed along a route that is c. 30 m higher than that of the Low-Level Aqueduct. It began at c. 805 m above sea level and was evidently meant to convey water to the Upper City of Jerusalem through the current Jaffa Gate, at an elevation of c. 765 m above sea level. At least part of this aqueduct was built in the Late Roman period, as indicated by the Latin inscriptions of centurions carved on stone sections that comprised part of the conduit west of ancient Bethlehem; however, many scholars were inclined to push back the date of its construction to the time of King Herod. Two excavations were conducted in the past along the Upper Aqueduct (‘Atiqot 69:69*–90* [Hebrew]) and the current excavation constitutes a direct continuation of the northern one of those excavations (Area A2). The excavation was carried out c. 250 m west of the national watershed, in an area where orchards of Qibbuz Ramat Rahel had previously been situated, and it was divided into two areas, one in the south (A3; Fig. 1) and the other in the north (A4; Fig. 2). A continuous segment of the aqueduct was exposed for a distance of c. 250 m. Along about half of the excavation area, the flow channel (specus) in the aqueduct, which was coated with several layers of plaster, was preserved, and in the rest of the area, only its foundations survived. A field wall was built alongside the aqueduct, for nearly its entire length. The aqueduct was built of a foundation (average width 1.6 m) upon which the specus was constructed. For most of the excavation’s length, the foundation was built of friable chalk fieldstones and ashlars, and along a short segment it consisted of hard limestone fieldstones. The quality of most of the construction was heedless; in most instances the aqueduct’s foundation was not set on the bedrock, the builders left large gaps between the foundation stones and did not use mortar. As a result of that, the aqueduct’s stability was undermined over the years and parts of it were found collapsed (below). The specus, leveled at an elevation of c. 776 m above sea level, was constructed on top of the aqueduct’s foundation. The original specus was relatively broad (width up to 0.4 m) and U-shaped; in later periods, plaster layers were applied to it at higher levels and its dimensions narrowed (just 7–12 cm wide). The latest specus was U-shaped, although not rounded but with square corners. At least eight plaster layers were discerned in one section; several of the layers were applied to surfaces lined with small stones (Fig. 3). The difference in elevation between the earliest layer and the latest exposed one is 41 cm. The exterior plaster of the specus, which was meant to protect it from the runoff that flowed down the slope east of the aqueduct, was preserved in several places. The multitude of plaster layers indicates that the aqueduct was used for a prolonged period; however, when no longer in use, its stones were plundered, particularly from the visible western side that also served as a retaining wall against the slope. The careless construction, plundering of stones and ground pressure from further up the slope accelerated the disintegration of the aqueduct’s remains, which also resulted in the collapse of portions of the specus (Fig. 4). Following the exposure of the aqueduct, parts of its foundation and the specus were taken apart in several places. While dismantling the aqueduct’s foundation in one particular location, a coin of Agrippa I (41–42 CE) was discovered, providing a terminus post quem for the aqueduct’s construction. Apparently, it operated during the Late Roman and Byzantine periods, which is also the date of most of the finds discovered along the aqueduct, especially the pottery. 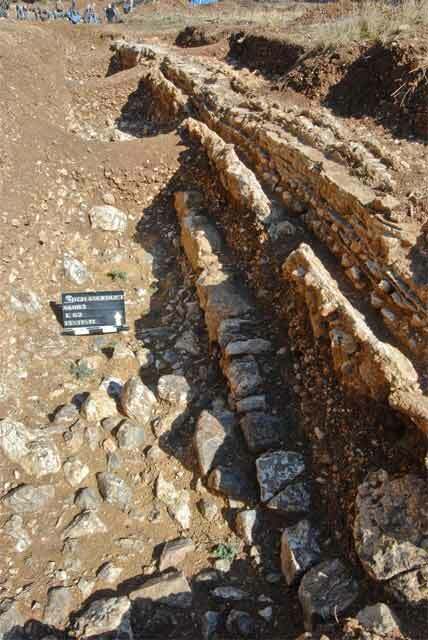 A field wall that ran parallel to the western side of the aqueduct for almost its entire length was exposed. The wall was built of medium and large chalk, limestone and flint fieldstones and was mostly founded on soil fill. The wall was preserved to a greater height than the aqueduct in several spots, but was generally lower. The wall was built of one to three courses and it varied in width (0.4–1.0 m). The wall shifted slightly away from the aqueduct (as much as 0.8 m) in certain sections and elsewhere, it was next to it and even built on the western part of the aqueduct’s foundation after the aqueduct’s stones had been robbed. Large chunks of plaster that collapsed from the specus were incorporated in two places in the wall and on their account, the route was determined some distance from the aqueduct; it is therefore possible to determine that the field wall was built after the aqueduct was no longer in use. The purpose of the wall is unclear. It mostly resembles a terrace wall, whereby one side facing downhill is nicely built and behind it, between it and the remains of the aqueduct and even on top of both, a fill of small fieldstones is placed. It sometimes seems that the surface between the field wall and the aqueduct remains was meant to be used as a road, but this impression is not consistent throughout the excavation area. Large amounts of small flint stones and limestone, which probably originated from clearing the agricultural area east of the aqueduct, were found along parts of the excavation; these were discarded at the foot of the aqueduct remains and to its west. This debris also covered the field wall. 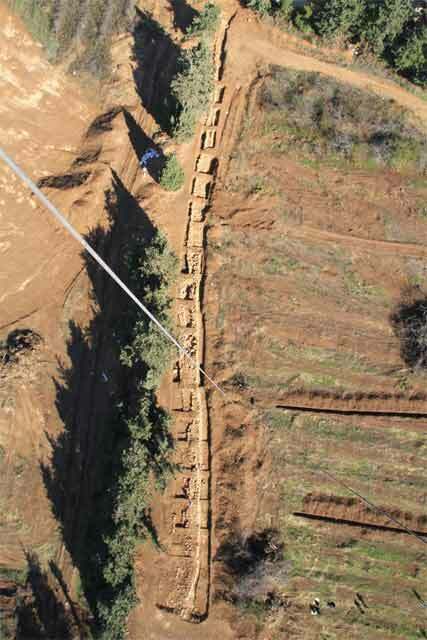 The High-Level Aqueduct section that was excavated is the longest continuous segment exposed to date. This is also the northernmost section of the High-Level Aqueduct that is known; remains found farther to the north have not, as yet, been defenitely identified as belonging to this aqueduct . 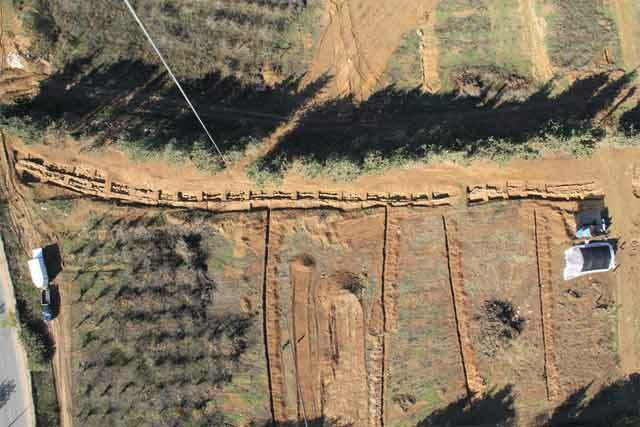 Along the excavation, the route of the aqueduct can be followed, as well as how it was built and the repairs made to it until it ceased to be used. In addition, the coin of Agrippa I that was found inside the aqueduct’s foundation proves that the conduit was not constructed prior to his reign; hence, it is impossible that Herod had built the Upper Aqueduct as some scholars proposed (see ‘Atiqot 69:78*–79*). 1. Area A3, aerial photograph. 2. Area A4, aerial photograph. 3. A cross-section of the specus with the several layers of plaster, looking north. 4. A chunk of collapsed plaster from the specus, looking northeast.